My journal article on Pittsburgh’s labor newspaper, “The National Labor Tribune,” officially exists. See pictorial evidence! This newspaper has been cited a lot as evidence, mostly in works about the history of labor and/or the Homestead Strike, but, as far as I know, this is the first article solely about the “National Labor Tribune.” My article deals with the men who wrote into the paper, but I am working on a presentation for the Society for the Study of American Women Writers right now that does a little more digging into the women who also read and wrote to the paper. The newspaper is not currently digitized, so one (me) still has to slog through microfilm to do anything with it. I don’t really mind this, but I fear that the fact that this newspaper and many other historical newspapers from Pittsburgh and western PA are not digitized is causing the region to be left out of a lot of scholarship. So much of our research relies on items that have been digitized. And, for example, there is only one Pittsburgh newspaper on “Chronicling America.” This is bad for people who care about Pittsburgh, but it is also detrimental to those studying newspapers and print culture in the U.S. in the nineteenth century. I predominantly have anecdotal evidence right now, but Pittsburghers in the nineteenth century at least liked to talk about how many newspapers and newspaper writers were in the city. Also, the 1880 census shows that Pittsburgh had twice as many newspapers as similar cities of its size. I think there is a lot more to be done on Pittsburgh and newspapers, but the work would come a lot faster if there was more access to historical newspapers online. None of these people are me. Via looking4poetry. 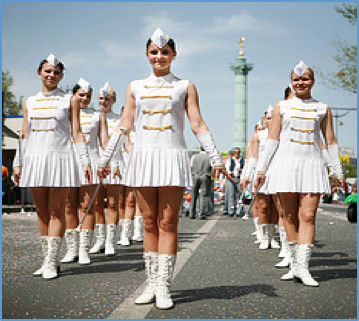 In high school I was a majorette, and while that has little bearing on my life right now, I was reminded of it when I read this recent piece by Anne Curzan on the Lingua Franca blog at the Chronicle of Higher Education. In the post, Curzan describes the tendency for academics to think they need to limit their outside activities if they want to be considered “serious academics.” Curzan explains what is wrong with this attitude and cautions against perpetuating it. This piece made me pause because I have noticed in the last year or two, as I came out of the tunnel that was my graduate education, that I had slowly lost touch with a lot of the sports and hobbies I used to participate in and enjoy. I was always what we call “a well-rounded individual.” In high school and college, I was involved in academic activities and also played sports and joined lots of clubs. However, if you had asked me a year ago what my hobbies were I would have said, “Uh, hanging out with my cat?” And while my cat is truly excellent, he is not a hobby. It was never a conscious choice to slowly shed my hobbies and many of them I would have outgrown anyway but not having enough ways to channel my energy was draining. Luckily in my last year of graduate school, I made friends with our department’s fiscal officer, and she taught me and a few other department members how to knit and crochet. 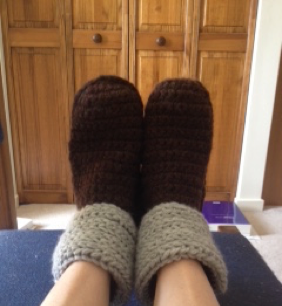 I still have only the very basics of knitting down, but I took quickly to crochet. Learning to crochet not only gave me an outlet to expend some energy and enjoy the health benefits you can often achieve from such activities, but it also taught me a lot about my work patterns. I’m not learning how to make things in order to glean lessons about my writing and work habits—that seems to go against the point of having a hobby—but it is an added benefit of having other focuses in my life. What I have learned most from crocheting is that mistakes are part of the process and that they should be embraced rather than avoided. There is a part of me that wants to get things right the first time—wants to cut the mistakes off before they even happen. This tendency has always been with me, but it has gotten worse as I have gotten older. I was even hesitant to start learning to crochet because I was nervous about being bad at it. Turns out you can’t really be bad at crochet. You can only be where you are and where you want to be. Plus, mistakes are important in handmade goods. It’s okay to make mistakes. It is actually completely necessary to do so. Mistakes can be undone or they can be incorporated, but they are part of what makes working on a project worthwhile. A machine can make something perfect, but it can’t make something handmade. If you are working on a crochet project and things aren’t going well, you can start over completely. Or you can pull stitches out and backtrack. Or you can just keep going. This is true of writing and other kinds of intellectual labor too, but working on a crochet project is so much more tangible than writing. Yes, you can see the progress of writing in terms of the words that exist on the page, but you can’t quite hold it in your hands the same way. Each stitch cannot be pulled apart or examined. You can’t take it downstairs and say to another person in the house, “Hey, look at this!” Maybe, we should all start printing out our drafts and making people take stock of them, not for the content on the page but for the fact that we made something that exists. Bringing something into existence is one of the greatest benefits of a craft project, and another advantage to working on something concrete is that you can see the evidence that you are getting better. There is a steep learning curve at the beginning with crochet and then the progress slows down, but at every step of the way I can see how I am improving. My stitches are more even, and I am much better at actually having the correct number of stitches in the row. Again, I know that I am also always improving my writing skills, but it is hard to see that. The biggest gains I see in my own writing are when I look back at what I wrote years ago. From that perspective, I can see the leaps and bounds I have progressed in terms of organization and style. But I can see the changes in my crochet skills immediately. This helps me remember that with work and patience I am also growing in my writing. I have also learned some things about my work habits that I need to consider changing from crocheting. For example, I love starting any kind of project. I want to prepare all of my materials and get started on whatever I decide to work on immediately. I will dive into my work and work vigorously on figuring out how to get going on a project. And then, I will stop. I won’t pick up the project for days or weeks or months on end. When I am moved again, I will take up the project in a similar spirit of intensity. I work on projects in very big chunks. For hours on end until my eyes cross, I will labor on a project. I will sit up late at night and stare at the computer screen until I figure things out. This is not to say that I don’t know better. I make my students tackle writing by slowing down their writing process. We plan, we draft, we move methodically from start to finish. I know I should follow this advice, and I am getting better at doing so. But seeing these patterns in places other than my writing has made me want to pay more attention to them in all of my work. It hasn’t really made me realize anything new—I knew these were my tendencies before, but a repetition of the patterns has made me want to learn how to recognize them quicker and find strategies for curtailing them. Finally, and this is no surprise, but it was important to have it reinforced, taking a break from my work and allowing my thoughts to percolate have made me more creative. There is a lot of information available about how creativity works, but anyone who has had the most brilliant thought pop into their head in the shower, does not need to read the books to know that creativity happens when you are not trying to make it happen. I have been more productive in my writing, since I have found another creative outlet to focus on. I’m very grateful that I have learned to focus on other channels now, before I was completely burned out from writing. What are your hobbies, reclaimed or new, and how do they help you in your professional life?